As of 8:30am Friday, Hurricane Florence is dumping rain on North Carolina and pushing a storm surge taller than most humans onto communities near the coast. 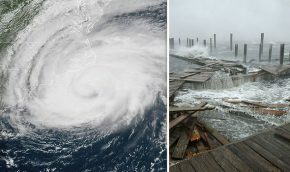 The centre of the eye of the hurricane made landfall in Wrightsville, North Carolina, and was moving slowly westward just south of Wilmington. Top winds were holding at 144 kph, a Category 1 hurricane, but some communities were already submerged in more than two metres of water as the storm drenched the coast.